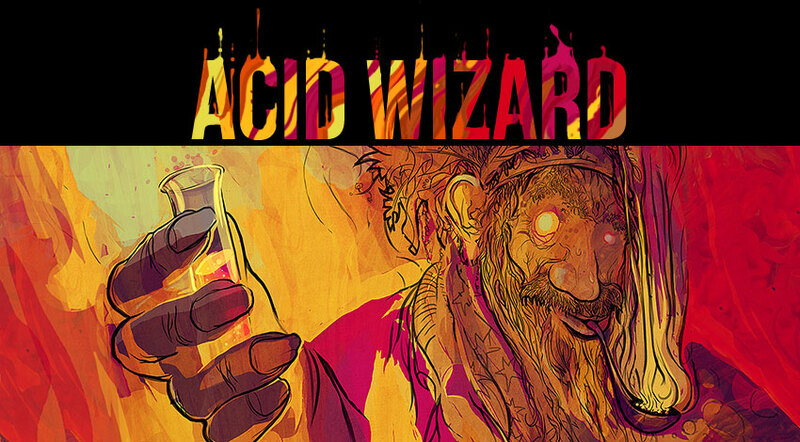 Acid Wizard Studio is 3 guys (and a dog) from Warsaw, Poland. We make trippy games. Contact us at wassup@acidwizardstudio.com. If you dare. Here’s a bugfix update for some of the issues that were introduced in the last major update. There are still some things left to be fixed, but all the most annoying bugs have been squashed, at least to our knowledge! – Loading times are shorter. – Added loading progress bar. – Changed rewards for completing Piotrek’s quest. – Added new sprites for Mushroom Granny. – Increased quality of lantern light. – Nerfed bottle / broken glass. – Nerfed damage done to barricades by knife. – Added sound of burning infection. – Added some map icons. – Fixed events with a delay not being completed in very rare cases if you save and reload your game immediately after it fires. This happened very rarely, but could break the game. – Fixed many objects not saving correctly or being a bit different after being loaded. – Fixed many random small issues like some sounds not playing in rare cases. – Fixed dead enemies having their sprite duplicated. – Fixed Human Spiders screaming even after being killed. – Fixed multiple ways of getting stuck on the second underground door in the tunnels. – Fixed getting stuck in the void after completing the Cellar dream. – Fixed performance drop when hanging around the Huge Lake for some time. – Fixed huge lag when the Talking Tree is burning. – Fixed being able to exit the second doctor dream. – Fixed some instances of the game breaking after loading the game directly after ending the doctor dream. – Fixed flicker when clicking on objects. – Fixed invisible objects inside of Snail’s house in some cases. – Fixed some AI behaviour, especially during night time. – Fixed some night events not happening. – Fixed help message being visible in main menu. – Fixed a rock blocking the way in the second part of the underground tunnels in a specific case. – Fixed several issues in Mushroom Granny’s or Child’s dialogue. – Fixed inventory respawning in dead trader NPCs. – Fixed Wolf dialogue when you kill the Sister and Chicken Lady at once. – Fixed infection not saving correctly. – Fixed infinite item durability bug. – Fixed journal pointing to a “empty” biome. – Fixed Cripple dialogue where he points you in a unspecified direction. – Fixed ambient light popup in village entrance. – Fixed having to re-enter Mushroom Glade to finish Mushroom Granny’s quest if you’ve done the thing she asks of you BEFORE visiting her for the first time. – Fixed a few issues with the Human Spider Minion spawner. – Fixed glitch if killing The Three via molotov. – Fixed The Three disappearing after having a dream during morning mode. – Fixed root sprite glitches in Swamp hideout during morning mode. – Fixed dark overlay textures along the edges of the world. – Fixed items resetting if you’ve died in chapter 2 on permadeath. – Fixed lakes sometimes overlapping the Quarry. – Fixed unnecessary final workshop upgrade. – Fixed man in church not having the medallion. – Fixed not having the plastic chick on start of chapter 1. – Fixed some objects being on bad layers. – Fixed quarry sometimes not spawning. – Fixed old version of snail location spawning on rare occasions. – Fixed gasoline trail saving incorrectly. – Fixed dead cripple disappearing after you’ve burned the tree. – Fixed invisible legs when walking on the bridge in chapter 1 village. I had to make the water impassable, maybe we’ll find a way to fix this in the future. – Fixed missing message when trying to quit in the 1st part of prologue. – Fixed events in the Big Lake after loading. – Fixed issues with the quest outcomes in the Musician house. – Fixed missing key in the church underground if you’ve killed the chomper in the dream. – Fixed items resetting for a game loaded from a previous compatible alpha and immediately loading a game after that. – Fixed being able to destroy Piotrek’s door. – Fixed Swamper bugging out if stepping into a beartrap. – Fixed chain trap remains not disappearing after some time. – Fixed being able to talk to the underground door after you open it. – Fixed mushrooms rotting during time freeze or inside trader inventories. – Fixed incorrect behaviour of mutated dogs in Wolfman’s Old Woods hideout. – Fixed incorrect item generation in some containers. – Fixed duplicate sounds for Chomper. – Fixed banshee first visit sometimes appearing outside of hideout, making it very risky to grab her “gift”. – Fixed barricade removal sound being too loud. – Fixed madman’s chest being empty. – Fixed some windows having bad sprites after having their barricade destroyed. – Fixed bad chomper behaviour in some ruins in the swamp. – Fixed some mushrooms being underwater in the mushroom glade. – Fixed double footsteps when running with a rifle. – Fixed very long burning effect when walking into the Talking Tree’s roots fire. – Fixed some particles not playing correctly after some time, like gas, blood splats etc. – Fixed incorrect crafting schematics in hideout 1 and 2. – Fixed not being able to jump over the rebuilt fences in the swamp hideout. – Fixed incorrect loading of characters that escaped out of their location and got killed. – Fixed morning sound not disappearing if you’ve died when it was playing. – Fixed having to rebuild the well each time after load. – Fixed some visual bugs in the quarry. – Fixed chomper getting glitched out when trying to eat a meat lure. – Added more columns to the porter inventory so it is visible on small screens if you’ve transported a lot of stuff. © 2019 Acid Wizard Studio. Theme: Baris by Malvouz. Proudly powered by WordPress.